Home Kitchen & Catering Equipment Thermometers Hygiplas easytemp thermometer red (raw meat). Hygiplas Easytemp thermometers feature a fold away probe and auto on/off facility to conserve battery power. 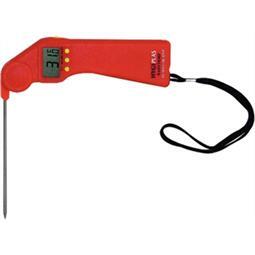 Accurate, reliable and robust these pocket thermometers are supplied with detachable wrist strap and AAA battery. Temperature range: -50°C to 300°C.